Bernie Sanders is so close. In an interview with MSNBC’s Chris Hayes Wednesday night, Sen. Sanders addressed rumors that members of the Democratic party have been booing him in private meetings, and demanding he support Clinton’s presumptive nomination for the sake of party unity. 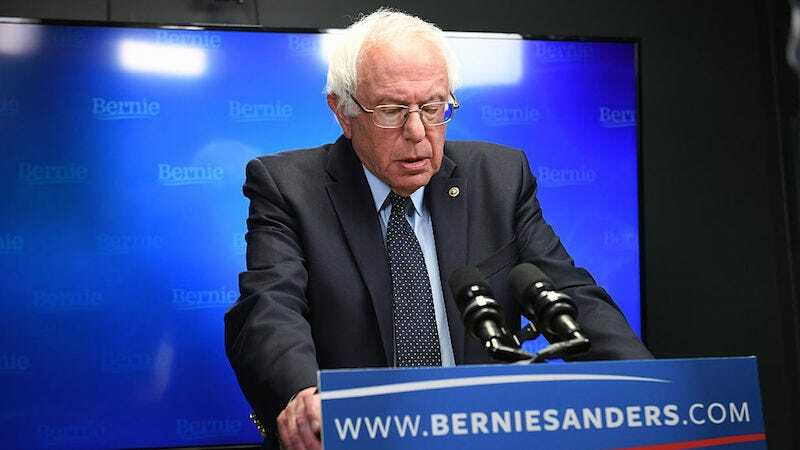 Sanders denied that his fellow Democrats are frustrated with his resistance and accusing him of “self-obsession” in his continued attempts to win the presidential nomination. He told Hayes not to believe everything you read in the papers, but admitted that he hasn’t had much support from House Democrats from the beginning. Sanders: And I am also on record, and will do everything I can, Chris, and I’m a pretty hard worker at these things, to make sure Donald Trump does not become President of the United States of America, because that would be an unmitigated disaster not just for our country, but for the world. And I am going to work with the Clinton campaign. We came together on higher education...I think at the end of the day there is gonna be a coming together, and we’re gonna go forward together and not only defeat Trump, but defeat him badly. Hayes: So you’re not denying that there are talks of a possible endorsement?